Here are some links to websites with useful Python resources, and Python files to download for the programs in this book. At this page you can run Python programs from "Coding for Beginners using Python", and test your own code. Tips for downloading Python if you have Windows® XP or Linux®. These zip files contain the code for all the projects in "Coding for Beginners using Python". Click on one of the files then use your computer's zip program to unzip and save the programs to your computer. To find out how to view and run the programs see page 6 of your book. First projects - up to and including 'Dictionaries'. Next steps - 'Spy messages' to 'Make a masterpiece'. Longer games - 'Dodge the bombs' and 'Bat and ball'. If you are using Python version 3.5.3, 3.6.0 or later, see below for an update to the 'Bat and ball' game. With some versions of Python, you may get an error message at the end of the game. Click on the link below to find out how to fix it. CORRECTION FOR PAGE 83: In the second code excerpt (blue box) at the top of page 83, the second line should read "or ballMoveX" (NOT "ballSpeedX"). Watch a video clip about computer programming. A useful introduction to programming. An introduction to coding, the Python programming language and what it's used for. Simple Python projects to try online. You can view the first two programs, and the final program at the bottom of the screen, but to access the other projects, you need to be a member of Code Club (find out more in "Code clubs" below). Play an exciting game called Code Combat - and learn to program in Python at the same time. 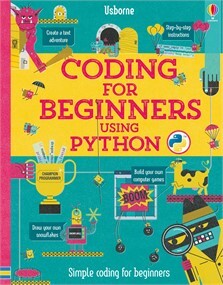 Here's a selection of tutorials to brush up your Python skills and give you more practice. A free online book with games and short programs to try. Online course on coding in Python. Python programming tutorials at Socratica. Python tutorials at Khan Academy. Try writing arcade-style games in Python. This is more of a challenge, so don't try it until you've finished working through the activities in the book. You will also need to download a library known as Pygame (see link below). A beginner’s guide to coding using Python, one of the most popular computer languages. Step-by-step instructions show how to get started and write a simple program. New commands are introduced with examples and colourful pictures so by the end of the book, readers can code games, drawings and more. Includes extra help and downloads online.